Plant taxonomy classifies this flower as Phlox paniculata 'David.' The cultivar is named after the husband of its developer, F. M. Mooberry. Both this genus and Jacob's ladder plant belong to the namesake phlox family of plants. 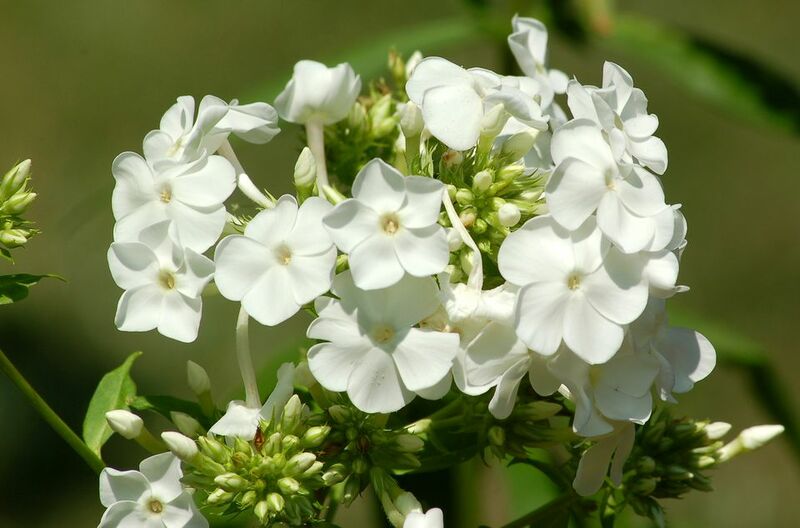 The P. paniculata species is commonly called "panicle," "summer," "tall," or, more often, "garden" phlox to distinguish it from P. subulata, for example, which, unlike its upstanding cousin, is a creeping plant. The creeping kind also blooms in spring, while P. paniculata flowers in summer. 'David' garden phlox is grouped with the herbaceous perennial plants. 'David' phlox reaches a height of 2-4 feet (maximum) and grows in clumps, with a spread of about 2-3 feet (maximum). It may stay smaller than that if growing conditions are not ideal. It bears small, white flowers. The fragrant flowers occur in clusters at the top of the plant. Leaves are lance-shaped. Its growth habit is upright. 'David' is best grown in full to partial sun and should be planted in a well-drained, loamy soil that has plenty of compost mixed into it. The perennial needs an average amount of water. 'David' garden phlox can be grown in the dappled-shade conditions of woodland gardens, although, in the North, it may flower better in full sun. Since it blooms in white and is fragrant, it is a good choice for moon gardens. In a mixed flower bed, this perennial may be tall enough to be used in the back row (depending on the size of the companion plants). It is a good idea to deadhead this perennial to stop it from reseeding and to extend the flowering period (the seedlings probably would not have the same appearance as the parent, since this is a cultivar, not a naturally occurring plant). Powdery mildew is a problem for garden phlox. It is a fungal disease, promoted by humid conditions. This is why these perennials do not grow well in the deep South. To help prevent powdery mildew, space your flowers so as to promote good air circulation, and avoid overhead watering. Dividing them in spring every so often (which keeps them smaller). Keeping them from reseeding (and thereby multiplying) by deadheading spent flowers. Another preventive step you can take against powdery mildew is to cut the plants down to ground level in fall (dispose of the leaves and stems properly; do not compost). 'David' phlox is listed as resistant to powdery mildew, but taking these steps will further reduce the chances of your plants getting this disease. Give 'David' garden phlox water during periods of drought. Mulching will help the soil retain moisture and prevent the soil from overheating. This perennial's height makes staking a good idea, as well, especially if you live in a windy area. This plant is one of the better performers within its species. It is robust and its leaves seem better able to retain a fresh look through the summer than is often the case for traditional panicle varieties. Like other plants in the species, it offers a long blooming period, from mid-summer to early fall. This is a period during which many gardens are starved for floral color, so such plants are valued by growers seeking continuous sequence of bloom. Where would the late summer garden be without these perennials? 'David' and other types of P. paniculata flowers are good hummingbird plants and good plants to attract butterflies, too. But, happily, they are deer-resistant perennials.